This blog often carries stories about copyright infringement, file-sharing, and other intellectual property issues that come up often for bloggers, social media users, and webmasters. 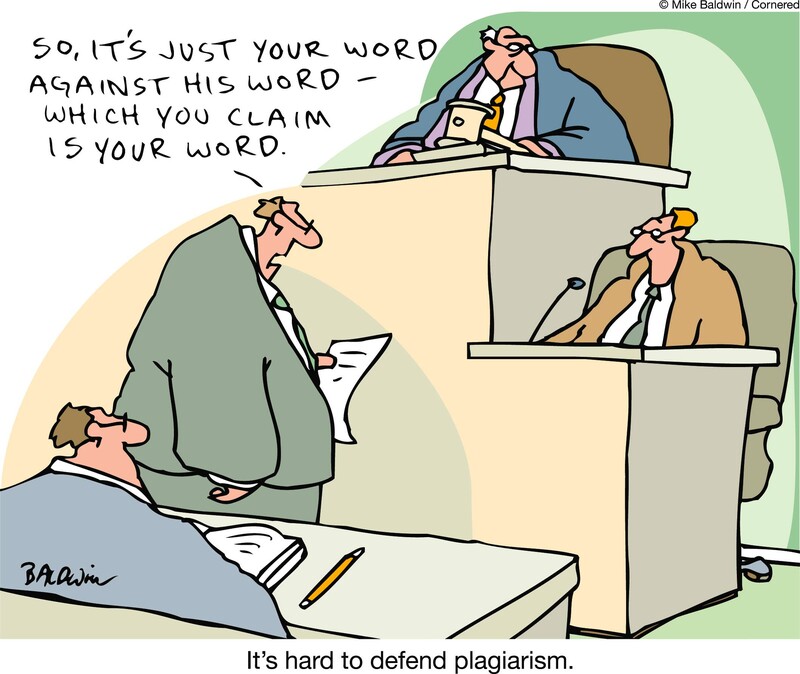 Plagiarism, on the other hand, is a topic that hasn’t been explicitly addressed here before largely because it seemed like a simple issue to me until very recently. About a month ago, a friend of mine I’ll call Greg called to say that he’d been offered a new blogging opportunity for a major magazine’s online edition. Greg is a very well-respected journalist with a long track record and a large fan base. But he has had some health issues, and the new gig will be his first regular job in almost two years. The site wants him to build up a content library quickly — and since his compensation comes directly to page views, shares, likes, and other metrics that go up as the amount of content rises, he wants to do that. Greg was very excited about the new job until his lawyer pointed out a clause that he hadn’t noticed buried in the multi-page contract. Maybe — and maybe not, the lawyer said. It would depend on how his new employer interpreted the contract. And, he added, it would also depend on the contract under which he was working when he wrote it originally. For instance, Greg worked at a large magazine as a staff writer for several years, and later was a freelance writer who sold 1st North American Serial rights to article to that magazine and others, retaining all other rights to the work for himself. So he could be guilty of copyright infringement — and be subject to the same damages anyone else might pay — if he plagiarized his own work produced for the magazine while he was an employee, but probably not for reusing quotes or small amounts of content from pieces he created as a freelancer. The idea of self-plagiarism was a new one to me — I’d never heard the term until Greg’s phone call. So I went looking for what I could find on the subject, and my first top was (as usual when the subject of plagiarism comes up) was the fabulous Plagiarism Today website. In a good article that looks at the issue from multiple sides, the website seems to define self-plagiarism as a problem only if the writer attempts to pass off old content as new content without disclosing that it’s been published before. Based solely on what I’ve read, this seems to be a signficant problem for academic and scientific writers. The concern seems to be that reusing one’s own content can skew the results of a scientific report or cause an ethical issue for the university or journal that publishes the report. But here’s the thing: academic writers are seldom dependent on their writing for their livelihood. The rest of us are. And that’s where it gets muddy for me. One of the things that has happened over the decades that I’ve been a published writer is that the rates paid to writers have plummeted. Recently, someone I know was offered $0.06 per word for a celebrity interview article by a magazine that paid me $1.50 per word for a similar story many years ago. Back then, they bought one time rights or First North American Serial Rights, and they paid extra for photographs I took to illustrate the story. Today, they want all rights, and are requiring original photographs as part of the deal. And they’re far from alone. Sites like elance.com and oDesk offer copywriting services for “original content” for even less than that, often from off-shore writers. It isn’t possible for a writer to produce enough original content at four or five cents per word to generate a living wage – at least not for a writer who aspires to a middle-class lifestyle in the USA. So I suspect that self-plagiarism is more common than anyone would admit. I’ve certainly done it — always with the explicit permission of the person paying for the new article or blog post, I should point out. So I guess that’s where I come down on the subject of self-plagiarism: if you disclose that you are citing something you previously published, and own the rights to use it, then I don’t see the problem. Obviously, my friend’s new employer feels differently. I wonder if he would have taken the job if he’d read the fine print in the contract first? Probably — it’s hard for a 50+ person to find a job these days, especially after two years of unemployment. I’ve always tried to be careful not to use work belonging to someone else without proper citation and links, but it never occurred to me that I had to worry about self-plagiarism. Now I know better! Cartoon credit: This image was licensed for use on this blog from Cartoonstock.com. Gallery | This entry was posted in Uncategorized and tagged Copyright, copyright infringement, plagiarism, self-plagiarism. Bookmark the permalink.